It really is kind of amazing that Instagram has shot past two million users in just a few months with only an iPhone app. No Android app, no website, no real third-party support. But starting today, that changes as they’re finally ready to unveil their API. And they already have some pretty nice implementations right off the bat to show what it can do. Co-founder Kevin Systrom says that it would have been easy enough for them to implement a simple API early on, but they didn’t want to do that (that’s why you may have heard about one developer getting unofficial access shut off). Instead, Instagram decided they wanted to make an API that was both massively scalable and provided a realtime feed of everything going on across the service. Today, they’re unveiling this realtime API for four different elements of Instagram: user photos, tags, locations, and geographies. 1) Users of the developer’s application: every time a user of an Instagram-linked application posts a photo, the developer’s application will receive a notification. Once a developer signs up for the API, they can choose which of these to implement. And Instagram has set up a demo site to give an example of what subscribing to certain geographies and getting updates in realtime looks like. But you can actually see the API in action elsewhere on the web and in apps already. Today, fashion photo sharing service Fancy, food picture sharing service Foodspotting, and cloud storage service Dropbox all have implementations up and running. 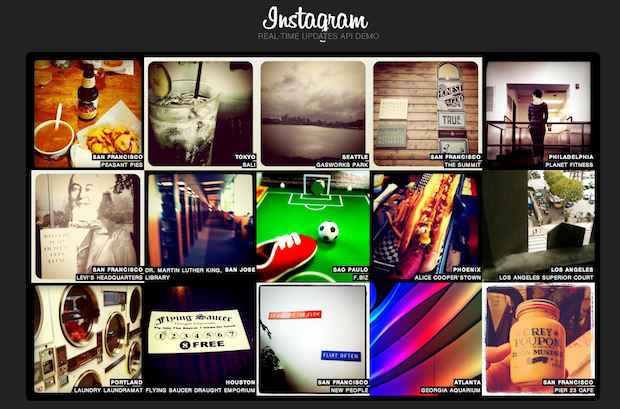 A service like Foodspotting taking advantage of Instagram’s API makes a lot of sense. Anyone who uses Instagram will know how many people take pictures of food. And now once they link up to their Foodspotting account, if they simply Instagram a food photo with “#food” or “#foodspotting”, Foodspotting will find it and add it to your feed of food. The Dropbox integration is interesting because it matches a feature that rival PicPlz has, but was built by an independent developer simply using both the Instagram and Dropbox APIs. Also launching today is Instagram integration with Momento, the awesome iPhone digital diary app we covered a while back. And coming shortly will be Flipboard and About.me integration as well, Systrom says. But those are all existing service using the API. 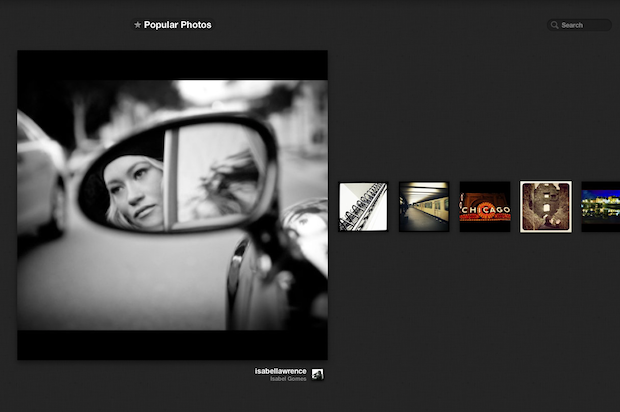 A new service, Instagre.at, has also popped up as a great web viewer for Instagram that was built from scratch. Systrom says that some 2,000 developers have already signed up for access to the API. That should explode starting now. I give it maybe a day until we see the first third-party Android app. One caveat: for now, the API is read-only.